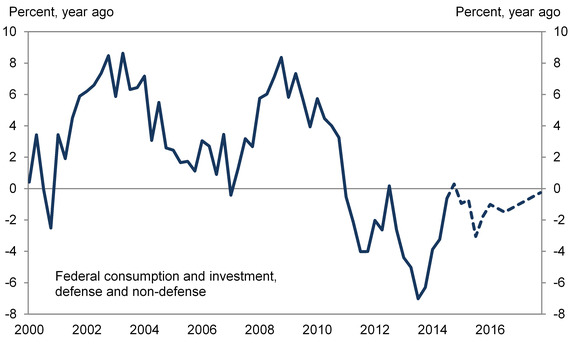 Goldman Sachs looked at the next year of projected federal spending in a research note out today. After a relatively austere 2013 and a flat 2014, Goldman expects federal spending to have either no impact or a slightly negative impact on real GDP. Congressional spending is trending downward, but there are a couple of reasons it might tick up, according to the note, mostly related to possible emergency defence spending (read: Iraq). 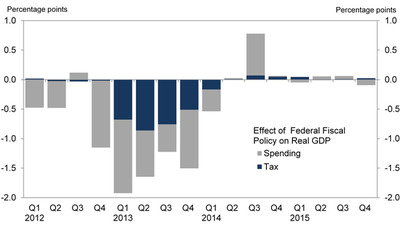 The chart above right shows how much federal spending and taxes have contributed to real GDP, and how much they are projected to over the next five quarters. With a Republican majority in both houses of Congress, an uptick in non-defence spending over the next couple of years seems even more unlikely than it might have been a couple of months ago.